According to CRISIL, there are nearly 100 million people aged 60 or more in India today, and that number will triple by 2050. Meaning, every fifth Indian will be between 60 to 69 years of age compared with one in twelve now. And most of them will be financially insecure in their sunset years if a social security net doesn’t get built starting now. And if a large number of the old end up having no pension by 2035-2050. As per estimates by the United Nations Population Division, this number will climb to 180 million (over 12% of population) by 2030 and nearly 300 million (over 18%) by 2050. Mark the import: In the next 35 years, the number of people aged 60 or more will multiply 2.6 times, while that of those in the working-age bracket of 15-59 will rise by less than half of that. This means there will be only 3.3 workers per old person in 2030 from 4.2 today. The number gets crunched further to 2.4 workers by 2050. 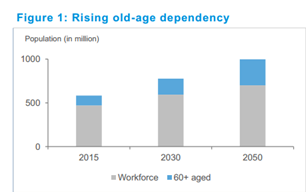 Figure 1: Rising old-age dependency Note: Workforce refers to people within the working age population who are looking for jobs and have found employment. CRISIL Research expects labor force participation to rise to about 71% by 2050, from 58.3% in fiscal 2012, while unemployment rate is assumed to remain unchanged at 2.2%. Source: United Nations Population Division, National Sample Survey Organization& CRISIL Research.